Show your true, undying love with this diamond eternity ring. Set with a row of sparkling round cut diamonds in a twisting design, this 9 carat white gold ring is the perfect symbol of your love for your perfect partner. 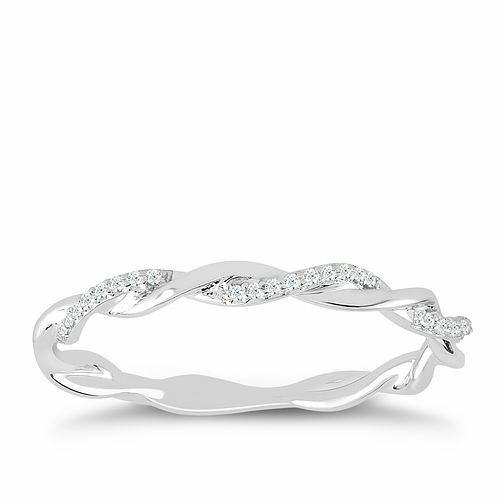 9ct White Gold & Diamond Twisted Eternity Ring is rated 4.8 out of 5 by 4. Rated 4 out of 5 by Anonymous from Lovely ring Having recently gotten engaged I want to get my partner a small token thing for her to wear too. She loves the twisting designs and being a chef wanted something that wouldn’t catch or risk breaking. First two boxes checked with this ring and it arrived early, yet to see how it’ll survive the cheffing environment but being of good quality and minimal design I don’t see it as an issue. Would definitely recommend as a small token/promise ring. Rated 5 out of 5 by Anonymous from Excellent value The ring was a great design and good value for money. Exactly what I was looking for!